To support our exploration of Gurumayi’s Message for 2019, Gurumayi has given specific guidance for a new series of monthly Siddha Yoga Meditation Sessions via audio stream on the Siddha Yoga path website. Gurumayi has imparted a title as well as a teaching to guide your application of her Message to your practice of Siddha Yoga meditation. I warmly invite you to participate in this new series, which will begin in this month of January and continue through September of this year. The sessions will be led by Siddha Yoga Swamis and other experienced Siddha Yoga meditation teachers. In this session, for which I will be the teacher, you’ll learn about the nature of the mind. You’ll also put into practice the means Gurumayi has given each of us in her Message to bring the mind to rest in its source. 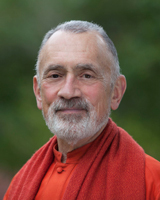 This session will be broadcast from Shree Muktananda Ashram on Saturday, January 26, at 10:00 a.m. Eastern Standard Time (USA). Following the audio stream, each of the monthly sessions will continue to be available as a webcast. When you register for a session, you gain access to it for an entire year—so you can participate in it as many times as you wish. You will be able to revisit not only the entire webcast but also any of its chapters—such as the exposition on Gurumayi’s teaching for the session or the dharana that leads you into meditation. Registration for Session I or for the whole series is open now. I wish you a most fulfilling year of meditation as you immerse yourself in your study and practice of Gurumayi's Message for 2019.